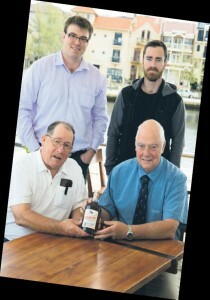 Two Perth distillers believe the market is ready for some top-quality locally produced bourbon. MARK Twain is reported to have said that ‘too much whiskey is barely enough’,and it seems young Perth drinkers are heeding his encouragement for a drop or two. Local distiller Alasdair Malloch says Western Australians’ increasing partiality to bourbon (whiskey), has prompted him and fellow distiller James McKeown to launch a plan for a new bourbon distillery in Perth – Whipper Snapper Distillery. further $3.2 million will be needed over the next two to three years to achieve full production and commercialisation. he sold after four years, tripling his money. He says Whipper Snapper will have competitive edge over American bourbons such as Jim Beam and Jack Daniels by matching the quality but also being locally made, much like he did with Colorado Gold. shorter, two-year ageing process enabling a faster return on investment. US but using Whipper Snappers’ equipment) for $280 as a capital-raising initiative. capturing a significant share of the market, including edging out international brands.